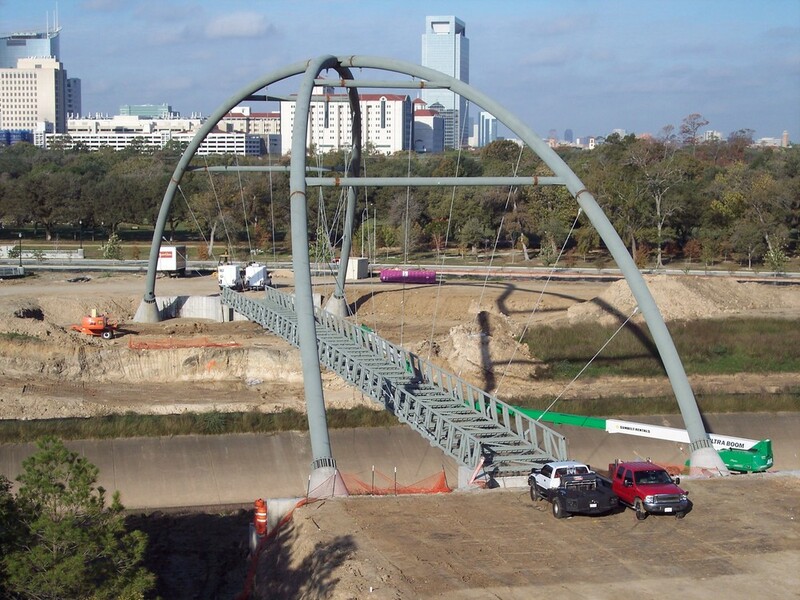 This signature steel, untied, non-parallel arch bridge across Brays Bayou, which is named the William Coats Bridge, is part of a systematic replacement of old wooden pedestrian bridges in Hermann Park as part of a makeover by Houston’s Public Works and Engineering Department and TxDOT. Besides revitalization, one of the primary goals was to widen the Brays channel to increase storm water capacity as part of the ongoing Project Brays. The new bridge structure allows neighborhoods located on the south side of Brays Bayou to more easily visit downtown amenities including restaurants, the Houston Zoo, and the Museum District. Trail improvements associated with the project have completed connectivity of the hike and bike trails in the park’s Bayou Parklands section within the main expanse of Hermann Park. Aguirre & Fields was selected to perform an independent peer review of the tubular steel, untied, non-parallel arch pedestrian bridge across Brays Bayou. The unique structure was approximately 17.50-ft wide by 290-ft long. Special emphasis was placed on investigating vibration sensitivity of the deck to pedestrian live load as well as evaluating lateral deflections due to wind load considering the bridge’s proximity to the hurricane-prone Gulf Coast.